View More In Dry Shampoo. For days when you just need a little oomph for your greasy hair. Or perhaps, you are laying off the nasty chemicals from shampoos. Or maybe, just maybe, you are a little like us and more often than not, miss a good wash every now and then. Fret not! 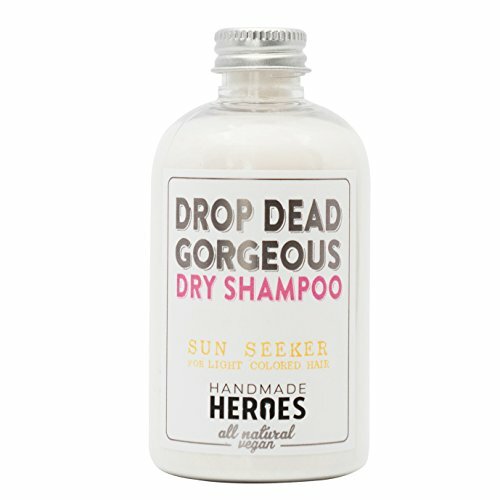 We've got you covered with our Drop Dead Gorgeous Dry Shampoo! Deodorizes with charcoal and refreshes with our signature essential oil blend, no one will ever have to know you skipped a hair day again! All natural, vegan and cruelty free. Made with absolutely NO parabens, preservatives or synthetic chemicals. Light floral scent with geranium and lavender. Made without: petroleum, mineral oil, lanolin, Vitamin E, gluten, parabens, phthalates, articifial fragrances, artificial flavors, dyes, or most common allergens. Manufacturer: Handmade Heroes Pte. Ltd. Publisher: Handmade Heroes Pte. Ltd. Studio: Handmade Heroes Pte. Ltd. If you have any questions about this product by Handmade Heroes, contact us by completing and submitting the form below. If you are looking for a specif part number, please include it with your message. R+Co Skyline Dry Shampoo Powder, 2 oz. Klorane Dry Shampoo with Oat Milk - Non-Aerosol - All Hair Types, 1.7 oz. R+Co Death Valley Dry Shampoo, 6.3 oz.